The best way to kick off the Christmas season is with the annual Dickens Festival on Main Street in Medford on Saturday, Dec. 6. Once a township event, it was saved by the Medford Sunrise Rotary Club with the help of Murphy’s Market four years ago. 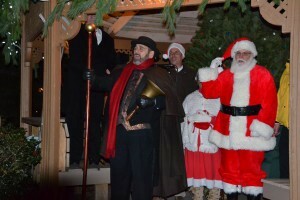 The festival begins at 6 p.m. with the appearance of Santa and Mrs. Claus, heralded by the town crier as they arrive in a carriage up to the gazebo, where they will sit among the trees and lights and greet each child in their own personal, warm way. Meanwhile, the street will come alive with musical groups caroling and entertaining from one end to the other, stilt walkers, the Give ‘n Take jugglers and vendors with everything from crafts to unique artwork. There will be face painting and balloon artists for the little ones, a moon bounce, and seasonal movies shown outdoors. A special treat for young and old will be an entertaining ice carving of a very special person by Michael Dormer. Children should be on the lookout for three Frozen characters wandering the street. Guests can choose from light fare to hot food from a variety of local restaurants and caterers. The shops of Main Street will have their doors open for all to come in, get warm, and browse. This is Medford Sunrise Rotary’s gift to the community. Come, bring family and friends, and have a great evening of entertainment.